"I was floored with the amount of information I found on the major narrow gauge lines in Colorado... This is a useful tool for your modeling and railfanning endeavors." Don Heimburger, Editor, "Sn3 Modeler" magazine, Spring/Summer 2006 Issue. 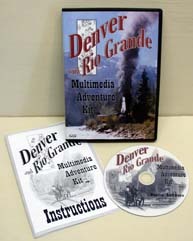 "What a wonderful resource for the modeler, rail fan, and Colorado historian! ...I found depots, a neat gallows turntable, bridges, and coaling facilities all worth modeling. ...I had fun searching for plans and found it easy to access and print them in 1/4-inch scale." Bob Brown, Editor, "Narrow Gauge and Short Line Gazette" magazine, Nov/Dec 2005 issue. Content on the DVD is fully searchable by keyword and you don't have to go on-line and wait to see it. Think about it, if you were to purchase all the content on this DVD separately, it would cost you many thousands of dollars, if you can even find it for sell! Then you have to search through all those books to find what you want, many of which don't even have an Index or Table of Contents. And, you still won't get the big picture. US funds. Check, MasterCard, Visa, Discover, Money Order. Price subject to change.